Big News --- We Are HALFWAY There! Thank you to those of you who already have donated to our GoFundMe campaign. So far we have raised $25,022 of our $50,000 goal, with online donations and checks! Helen: "I donated because I have been reading your posts for years, have won a couple of books and treasure all the up-to-date information. I definitely want this wonderful source of book info to continue." Carolyn: “I read Carol's newsletter every week. I find her comments and Bets On picks helpful. I don't have as much time to read as I once did, so I depend on her newsletter to steer me to my next good book!" Barbara: “I look forward to perusing the newsletter whenever I see it appear in my email. Carol, you do a great job!" Thank you again for your consideration and your donation. And I owe lots of thank-you notes! 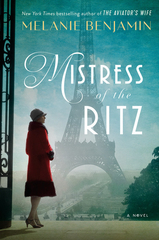 (on sale April 23rd), and MISTRESS OF THE RITZ by Melanie Benjamin (on sale May 21st). during her appearance at Indigo in Short Hills, NJ. 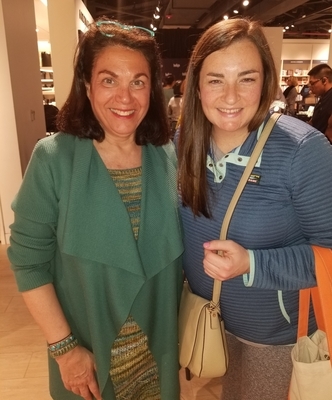 While at the Indigo event, Carol met Monica Vesely, a Bookreporter reader who was accompanied by a friend. Both Monica and her friend shared stories about their newly formed book group. at the Brandeis Author Luncheon in Boca Raton, FL. Spring Has Sprung --- and the Sugar Moon Was SO Bright! The Sugar Moon has made sleeping “interesting” this week. I am one of those people who needs complete darkness to sleep well; blackout drapes are de rigueur. Little things like the red button on a TV or the blue light that indicates my phone charger is working will wake me up. Hotel rooms are often a nightmare with the lights on the phones and the sprinkler systems. This week it felt like it was 2pm at 3am; the moon was that bright. I was wearing eyeshades last night like some Hollywood celebrity. But I did get some good reading in when the moon woke me up. More on that in a second. 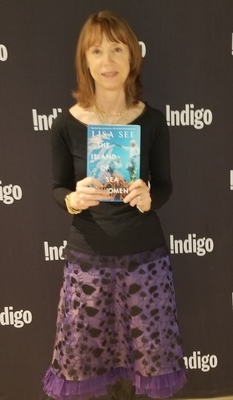 When we left off last week, I was headed to Indigo in Short Hills, NJ, to see Lisa See. It was a lovely evening where Lisa gave a brilliant talk about her latest book, THE ISLAND OF SEA WOMEN. One man in the audience was of Korean descent and gave Lisa praise as being “immortal” for writing about the island of Jeju and its inhabitants, which was quite a wonderful moment to have been a part of. He feels this was a story that needed to be told. As Lisa was signing and taking photos with readers, a young woman came over to introduce herself to me. Monica Vesely had been at the Morristown Festival of Books when I interviewed Kate Quinn and subsequently signed up for the Bookreporter newsletter. She read that I was going to be at Indigo, and I am so happy she came up to say hello. You can see a picture of the two of us above. She was with a friend, and they both shared stories about their newly formed book group, which I loved hearing about. Cristina, Sarah and Patti, some of our Coral Gables readers, caught up with Lisa at Books & Books there. Lisa recognized Cristina as she had taped the two of us for Facebook Live at the Miami Book Fair two years ago. Here’s a treat: I found this interview done this week where Lisa is interviewed by Sarah McCoy, who you may know as the author of MARILLA OF GREEN GABLES. Last weekend, I hung out on the couch kicking things back a BIG notch with some great reading. 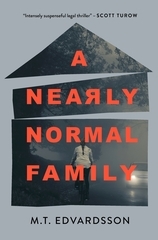 First up was A NEARLY NORMAL FAMILY by M.T. Edvardsson; it’s a Swedish translation from Rachel Willson-Broyles and a complete page-turner. Stella is 18 years old and accused of murdering a man in his early 30s. How did these two meet, and what would be her reason for wanting to kill him? We start out hearing the story from her father’s point of view; he is a pastor and a tad naïve about what is going on. We then hear Stella’s point of view, and whoa, the story has a whole other side to it. Then let’s flip one more time and hear from Stella’s mother, who is a criminal defense attorney. Who is lying? Who is telling the truth? What is the truth? 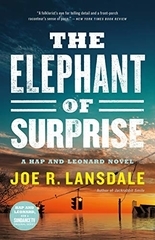 A bookseller friend, Pamela Klinger-Horn, hit it right, saying that this book is perfect for fans of William Landay’s DEFENDING JACOB. I agree. It will be a Bookreporter.com Bets On pick when it releases on June 25th. 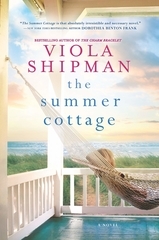 Next, I thoroughly enjoyed THE SUMMER COTTAGE by Viola Shipman, which is set in Saugatuck, Michigan; it will be in stores on April 23rd. Adie Lou Kruger (I must ask where that name came from) is getting divorced from her professor husband, who took a shine to one of his grad students. As they are splitting up their assets, she realizes that she wants Cozy Cottage, a summer home that needs a lot of love to be restored. While it’s short on the latest design features, it’s big on memories as Adie Lou’s grandparents were big on rules for enjoying life at the cottage, and she intends to keep forging these traditions and transform the house into a B&B. I loved reading about the home restoration --- and all the crazy moments that she went through before the place was ready to rent. And from there, it was as much fun to see life from the other side of the front desk, as she caters to demanding guests --- but also encourages them to adapt her grandparents’ rules. Great fun...and, yes, it also will be a Bets On. BTW, this book made me want to grab a map and note upcoming books set in every vacation spot around the country. Hmmm…I may do just that. 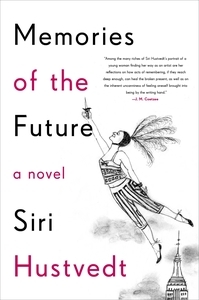 I have enjoyed many of Melanie Benjamin’s novels, and her upcoming MISTRESS OF THE RITZ, coming out on May 21st, is the third book that I am making a Bets On. 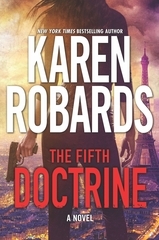 It’s set in Paris during World War II, where Blanche Auzello and her husband, Claude, are the mistress and master of the Hôtel Ritz, one of the city's best-known hotels. Blanche is American and is hiding a secret from the Nazis who are encamped at the Ritz. She’s also a member of the Resistance, going to all lengths to try to outwit the Germans, who she feels are causing blight on a place she loves so much. It’s based on true events, and you will find yourself rooting for both Blanche and Claude as they navigate some very tough waters, putting their lives on the line. I read a lot of this book when the moon was shining through my window! It has a conclusion that I did not see coming. Some really great reading…and I am looking forward to more this weekend. I was not the only one at an author event this week. 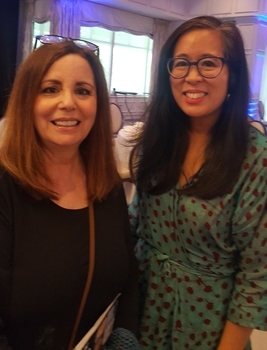 Melanie, who edits our Word of Mouth and Sounding Off on Audio features, attended the Brandeis Author Luncheon in Boca Raton, FL on Wednesday. Among the author guests were the aforementioned Kate Quinn, Pam Jenoff and Lisa Ko, the latter of whom you can see with Melanie above. Melanie also shared that THE HUNTRESS and THE SILENT PATIENT both are trending on Word of Mouth. My book group is reading THE HUNTRESS next month. 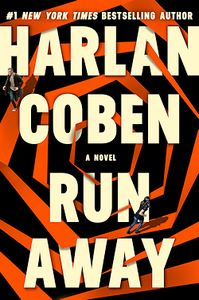 Harlan Coben is back with a new novel of domestic suspense, RUN AWAY, in which a perfect family is shattered by the loss of a daughter who is addicted to drugs, has an abusive boyfriend and doesn’t want to be found. Joe Hartlaub has our review and says, “What you will find in RUN AWAY as things progress and conclude would be more than enough to keep you reading and entertained throughout, but you will get even more than you might reasonably expect…. 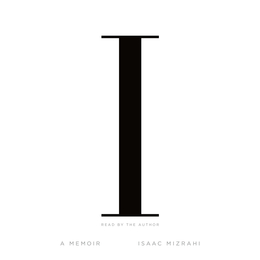 [E]very parent --- or everyone who knows a parent --- who reads this fine work will feel a shiver and hope that what transpires in these pages never happens to them.” I read it…and I do agree. I have not read Harlan in a while and have to say this is edgier than the books of his that I remember! RUN AWAY is one of our current Word of Mouth prize books; the other is BLOOD OATH by Linda Fairstein, which we plan to review next week. Submit your comments about the books you’ve read by Friday, March 29th at noon ET, and you’ll have a chance to win both these anticipated thrillers. 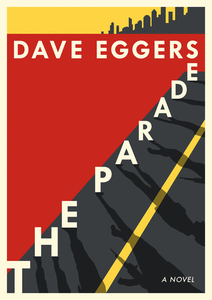 Other books we’re reviewing this week include THE PARADE, Dave Eggers’ new work of fiction that tells the story of the role that two foreigners play in a nation’s fragile peace; QUEENIE, Candice Carty-Williams’ debut novel that offers a bittersweet account of a tumultuous, transformative year in one young woman’s life; THE LAST YEAR OF THE WAR, Susan Meissner’s novel about a German American teenager whose life changes forever when her immigrant family is sent to an internment camp during World War II; and MEMORIES OF THE FUTURE by Siri Hustvedt, which tells the story of a young Midwestern woman’s first year in New York City in the late 1970s and her obsession with her mysterious neighbor. My three latest Bets On selections are HOUSE ON FIRE by Bonnie Kistler, the audiobook of I.M. 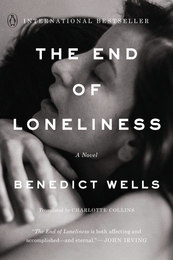 by Isaac Mizrahi, and THE END OF LONELINESS by Benedict Wells. Click on each of the titles for my commentaries. Our Spring Preview contests kicked off this week with our first two giveaways: LAWN BOY by Jonathan Evison (now available in paperback) and A PEOPLE'S HISTORY OF HEAVEN by Mathangi Subramanian. Next week’s prizes will be DAISY JONES & THE SIX by Taylor Jenkins Reid (a Bets On pick) and NANAVILLE: Adventures in Grandparenting by Anna Quindlen, which releases on April 23rd. The first contest of the week will go live on Tuesday, March 26th at noon ET. 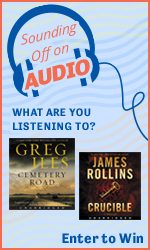 Let us know by Monday, April 1st at noon ET what audiobooks you’ve listened to in this month’s Sounding Off on Audio contest, and you’ll be in the running to win the audio versions of Greg Iles’ CEMETERY ROAD, read by Scott Brick, and James Rollins’ CRUCIBLE, read by Christian Baskous. And in more audiobook contest news, please keep in mind our ReadingGroupGuides.com giveaway for Melinda Gates’ upcoming book, THE MOMENT OF LIFT: How Empowering Women Changes the World. Ten book groups will win six digital copies of the audiobook, which is read by Melinda herself, and share their comments on it. We also are awarding 40 listeners a physical copy of the audiobook, which releases on April 23rd. To enter, all you have to do is fill out this form by Wednesday, April 3rd at noon ET. I started listening to an advance copy this afternoon and found myself completely caught up in it. Melinda articulates what comes from lifting women up in life. She is an excellent narrator, and I am looking forward to hearing more. Our poll continues to ask which of 20 fiction titles releasing this month you are planning to read, if any. Click here to let us know. The first-ever Colorado Book and Arts Festival took place last Saturday in Arvada, Colorado. This one-day literary arts festival, which celebrates books, art and music for the whole family, was made possible by Tattered Cover Book Store’s partnership with the Arvada Center for the Arts and Regis University. Roberta Gately, the author of LIPSTICK IN AFGHANISTAN, THE BRACELET and FOOTPRINTS IN THE DUST, was one of 40 authors who attended the festival, and she talks about her experiences there in this terrific blog post. Many thanks to Roberta for taking the time to share her insights with us! Reader Mail: Pat wrote, “Carol, I know a book you might like: THE SUSPECT by Fiona Barton. It's a good story, but even if you didn't like the story, you would love the cover. The protector is turquoise, but the actual binding cover is the prettiest shades of turquoise: light and dark! Check it out if you haven't seen it. It reminded me of your love for anything that color. Thanks for the great recommendations. I always look forward to reading anything Bookreporter!” Pat, thanks for the recommendation. I reached out to get a copy! Delia Owens on "CBS Sunday Morning": Here’s a link to the interview that I mentioned last week. Emilia Clarke, aka "Game of Thrones" Mother of Dragons: Great piece in The New Yorker about her brain aneurysm surgeries after seasons one and three. "Finding Neverland": I watched part two on HBO, and it is really sad to see what those boys went through. Knitting with Wegmans Bags...Seriously: This woman made a skirt from 140 bags and a coordinating jacket from 170 bags. One cannot make these things up. I have library events scheduled for Fairfield, CT (April 30th), Rockville Centre, NY (June 20th) and Avalon, NJ (June 28th). More to come on each of these soon. This is the time of year when I miss having kids in school who are headed on spring break, so I too could take a break. Quiet weekend on tap. There will be basketball, including my favorite parts: commentary by Charles Barkley and the Capital One commercials. My dad is coming over tomorrow to help Tom install a piece that he built for the kitchen, and my mom is coming too. We'll make something fun for dinner! I am excited to get some more upcoming books read (so many good ones this year) and kick it back a notch. I also got a screener of the first episodes of the new season of "The Chi" from Showtime and am looking forward to watching; I thought season one was terrific. 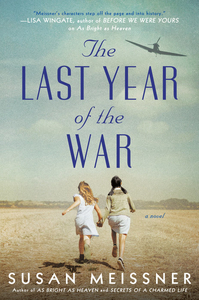 Elise Sontag is a typical Iowa 14-year-old in 1943 --- aware of the war but distanced from its reach. Then her father, a legal U.S. resident for nearly two decades, is suddenly arrested on suspicion of being a Nazi sympathizer. The family is sent to an internment camp in Texas, where Elise feels stripped of everything beloved and familiar, including her own identity. The only thing that makes the camp bearable is meeting fellow internee Mariko Inoue, a Japanese-American teen from Los Angeles, whose friendship empowers Elise to believe the life she knew before the war will again be hers. But when the Sontag family is exchanged for American prisoners behind enemy lines in Germany, Elise will face head-on the person the war desires to make of her. Reviewed by Rebecca Wasniak. As she listens to Lucy Brite through the thin walls of her dilapidated building, S.H., aka “Minnesota,” transcribes her neighbor’s bizarre and increasingly ominous monologues in a notebook, along with sundry other adventures, until one frightening night when Lucy bursts into her apartment on a rescue mission. Forty years later, S.H., now a veteran author, discovers her old notebook, as well as early drafts of a never-completed novel while moving her aging mother from one facility to another. Ingeniously juxtaposing the various texts, S.H. measures what she remembers against what she wrote that year and has since forgotten to create a dialogue between selves across decades. The encounter both collapses time and reframes its meanings in the present. Reviewed by Sarah Rachel Egelman. - Click here to visit Bonnie Kistler's website. 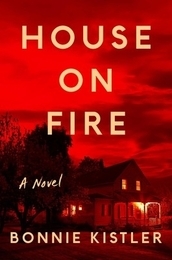 Click here to read more of Carol's commentary on HOUSE ON FIRE. - Click here to read a review of the hardcover. Click here to read more of Carol's commentary on I.M. Click here to read more of Carol's commentary on THE END OF LONELINESS. Our next prize book will be announced on Tuesday, March 26th at noon ET. ReadingGroupGuides.com is proud to host a very special audiobook contest for THE MOMENT OF LIFT: How Empowering Women Changes the World, a timely and necessary call to action for women's empowerment. Ten book groups will win six digital copies of the audiobook, which is read by the author, Melinda Gates, and releases on April 23rd. Additionally, we will be giving 40 listeners a physical copy of the audiobook. To enter, please fill out this form by Wednesday, April 3rd at noon ET. In order to qualify as a winning group, your group must be able to commit to listening to and discussing THE MOMENT OF LIFT, and sharing your group's feedback with us, by Friday, June 21st. We strongly encourage all winners to share their experiences on social media, including reviews on Amazon, Goodreads and Bookreporter.com's “Sounding Off on Audio” feature. For the last 20 years, Melinda Gates has been on a mission to find solutions for people with the most urgent needs, wherever they live. Throughout this journey, one thing has become increasingly clear to her: If you want to lift a society up, you need to stop keeping women down. Melinda’s unforgettable narrative is backed by startling data as she presents the issues that most need our attention --- from child marriage to lack of access to contraceptives to gender inequity in the workplace. And, for the first time, she writes about her personal life and the road to equality in her own marriage. Throughout, she shows how there has never been more opportunity to change the world ---- and ourselves. 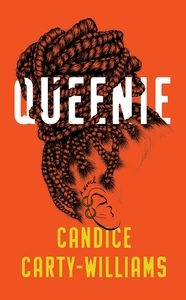 Writing with emotion, candor and grace, she introduces us to remarkable women and shows the power of connecting with one another. 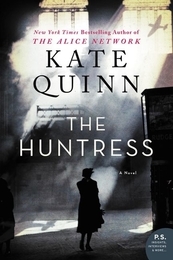 Kate Quinn follows up her 2017 bestseller, THE ALICE NETWORK, with another fascinating historical novel about a battle-haunted English journalist and a Russian female bomber pilot who join forces to track the Huntress, a Nazi war criminal gone to ground in America. We are celebrating the release of THE HUNTRESS with a special contest that will give three groups the chance to win 12 copies of the book. Enter here by Wednesday, April 3rd at noon ET. Each month in our "What's Your Book Group Reading This Month" contest, we ask book groups to share the titles they are reading that month and rate them. From all entries, three winners will be selected, and each will win 12 copies of that month’s prize book for their group. 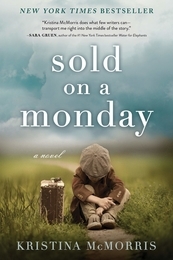 This month's prize book is SOLD ON A MONDAY, Kristina McMorris' New York Times bestseller about a Depression-era reporter who snaps a photo of two children being sold on a farmhouse porch, leading to his big break --- and devastating repercussions for everyone involved. Enter here by Wednesday, April 3rd at noon ET. Click here to visit ReadingGroupGuides.com. 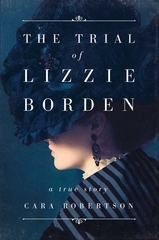 When Andrew and Abby Borden were brutally hacked to death in Fall River, Massachusetts, in August 1892, the arrest of the couple’s younger daughter Lizzie turned the case into international news and her trial into a spectacle unparalleled in American history. Reporters flocked to the scene. Well-known columnists took up conspicuous seats in the courtroom. The defendant was relentlessly scrutinized for signs of guilt or innocence. Everyone --- rich and poor, suffragists and social conservatives, legal scholars and laypeople --- had an opinion about Lizzie Borden’s guilt or innocence. Was she a cold-blooded murderess or an unjustly persecuted lady? Did she or didn’t she? Reviewed by Curtis Edmonds. It took one hell of an effort for the authorities to finally get the jump on master manipulator Bianca St. Ives, but now that they have, it’s far from the capture she expected. Instead of taking her in, there’s an offer on the table, a one-shot deal that would allow Bianca to walk away scot-free as if they’d never found her. And all she has to do is run one last mission --- the kind from which she might never return. An intelligence operation is already underway in North Korea, one that’s poised to end the country’s existing tyrannical regime for good. But first, the US needs one of their own to go undercover as the female hacker who recently stole top-secret intel from NORAD. Enter Bianca. Reviewed by Pamela Kramer. 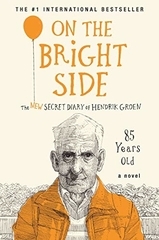 Everyone's favorite octogenarian is back, and together with his pals in the Old-But-Not-Dead Club, he is more determined than ever to wreak havoc and turn a twinkly eye on the brighter side of life. After a year spent mourning the death of his beloved friend, Eefje, Hendrik may be older and a little more wobbly, but his youthful appetite for mischief hasn't diminished. When fears arise that the home is set for demolition, it's up to Hendrik and the Old-But-Not-Dead Club to intervene. Reviewed by Cindy Burnett. 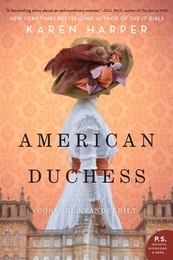 By day, Mary Ballard is lady’s maid to Charlotte Walden, wealthy and accomplished belle of New York City high society. But on her nights off, Mary sheds this persona to reveal her true self: Irish exile Maire O’Farren. 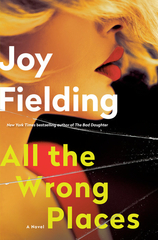 She finds release from her frustration in New York’s gritty underworld --- in the arms of a prostitute and as drinking companion to a decidedly motley crew consisting of a barkeeper and members of a dangerous secret society. Meanwhile, Charlotte has a secret of her own --- she’s having an affair with a stable groom, unaware that her lover is actually Mary’s own brother. When the truth of both women’s double lives begins to unravel, Mary is left to face the consequences. Reviewed by Maya Gittelman. Below are some notable titles releasing on March 25th and 26th that we would like to make you aware of. We will have more on many of these books in the weeks to come. 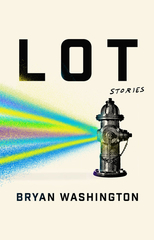 For a list of additional hardcovers and paperbacks available the week of March 25th, see our “On Sale This Week” newsletter here. Army intelligence officer Amy Cornwall receives a phone call with a terrifying ultimatum: locate and liberate an unnamed captive in 48 hours, or her kidnapped husband and 10-year-old daughter are dead. Doug Brock hasn't had it easy since getting shot in the line of duty as a New Jersey state police officer and developing amnesia. But now an old case of his has resurfaced, and it’s up to him to retrace his steps --- steps he can’t remember --- to solve it. Stolen sports cars, brilliant casino heists and the brazen kidnapping of a prince: only the shadowy spy-for-hire Simon Riske can stop the mastermind behind it all. The carefully constructed world that violin prodigy Cara Delaney has built for herself is suddenly threatened when she is kidnapped by a mysterious man trying to settle a score against her family, setting off a violent chain of events that puts everyone Cara loves in danger. The celebrated Pulitzer finalist and prize-winning author of DINNER AT THE CENTER OF THE EARTH and WHAT WE TALK ABOUT WHEN WE TALK ABOUT ANNE FRANK delivers a streamlined comic masterpiece about a son’s failure to say Kaddish for his father. The latest thriller from the internationally bestselling author of THE LAKE OF DEAD LANGUAGES and THE OTHER MOTHER is a story of mistaken identities and missed chances, forgiveness and vengeance. Stone Barrington and his latest paramour are enjoying a peaceful country retreat when their idyll is broken by an unwelcome stranger. He was sent by an enemy, someone who'd be happy to silence Stone and all his collaborators for good. Click here to vote in the poll by Friday, March 29th at noon ET. Tell us about the books you’ve finished reading with your comments and a rating of 1 to 5 stars. 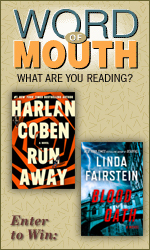 During the contest period from March 15th to March 29th at noon ET, three lucky readers each will be randomly chosen to win a copy of BLOOD OATH by Linda Fairstein and RUN AWAY by Harlan Coben. Tell us about the audiobooks you’ve finished listening to with your comments and a rating of 1 to 5 stars for both the performance and the content. During the contest period from March 1st to April 1st at noon ET, two lucky readers each will be randomly chosen to win the audio versions of Greg Iles' CEMETERY ROAD, read by Scott Brick, and James Rollins' CRUCIBLE, read by Christian Baskous.